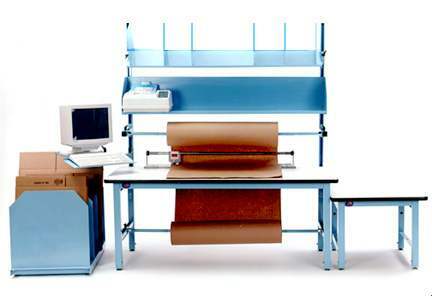 Proline's PB Model Packaging Workbenches can be purchased complete with all accessories shown or remove those accessories not necessary for your application. It's easy with our modular design. 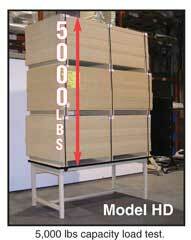 Standard Height 30" with adjustment to 36" with provided Leg Extensions (HDLE-6). The extensions slip into the steel legs and allow adjustment in one inch increments, 6 inches maximum. Set of four included. 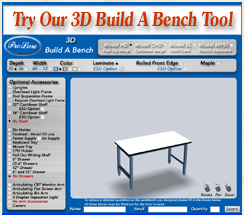 The illustration includes Optional Equipment. Click here. Accessory table facilitates keeping scale weighing surface even with work surface so packages can be slid onto scale, rather than hefted onto the scale. Scale stands come complete with a plastic laminate worksurface, and a set of HDLE-6 Leg Extenders that makes unit adjustable (to accomodate different height scales) from 24"H to 30"H.
Provides functional storage of boxes and sheet materials adjacent to packaging station. Keeps boxes clean and off the floor. Will protect corrugated in case of spills and other floor liquid events (waxing, washing, etc). Stops wasted trips to box inventory storage. Cardboard stand is 24"W x 36"L with 5 steel dividers 24"W x 24"H. Painted steel to match workstations. Weight: 45 lbs., Call for pricing.